There’s no doubt that developing a new wayfinding program is a major undertaking. From securing the budget and conducting an audit to creating the strategy and design, the process can feel like a marathon. At the beginning, you’re filled with excitement about all of the possibilities, but then the middle tests your patience and stamina. And just when you think the end is in sight, you have to summon all of your strength to make it to the finish line. Don’t get me wrong…the final wayfinding implementation phase, which includes sign fabrication and installation, is really exciting. Your brand is launched and signs are finally going into the ground (hooray!). But it also involves third parties, long timelines, materials and lots of documentation and design files. Needless to say, things get complicated. 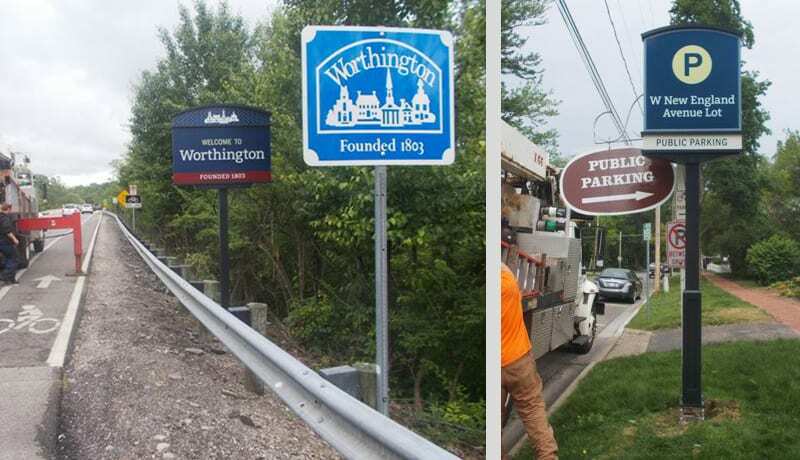 While we understand the temptation to coast your way to the end, it’s important to dig deep and avoid taking any shortcuts, especially when it comes to managing sign fabrication and installation on your own. Sure, you may save some time and money at first, but getting things wrong during these important steps can translate into the exact two things you were trying to avoid: MORE time and MORE money. Wayfinding consultants will work with you every step of the way to get to the implementation phase. The comprehensive designs support your goals and your audience’s needs, and, at least in our case, consultants often prefer to see the project all of the way through implementation to ensure the finished product aligns with the design intent, looking at everything from fonts, colors, materials, communication, placement and more. Lower costs – If you’re handling fabrication and installation on your own, you may be able to find a contractor who comes in with a very low bid and promises to execute the project as quickly as possible. Just be mindful that get what you pay for – lower costs often mean sacrificing the quality of the finished product. You’re not alone – While your designer hands off designs to the contractor you select, keep in mind that he or she won’t leave you hanging. Your consultant should provide a bid instruction sheet to help you evaluate prospective contractors. No strategic context – When you transition complex designs to a contractor who hasn’t been involved in the process prior implementation, they lack the understanding and rationale around decisions on design, scale, size, dimensions, colors and placement/locations. As a result, mistakes can be made and details can be overlooked. Low quality materials – When contractors are competing against each other for your project, they’re trying to bring their estimates down to the lowest price point. While this is good in the short-term, it means they will cut corners (no pun intended) and use low-grade materials, which will degrade the intended design. Expect delays – Because fabricators aren’t responsible for the design, they may ignore important elements of the instructions or shop drawings in favor of getting the job done quickly. Timeliness is critical, but it should never be at the cost of the design. Communication barriers. Sign fabricators and installers use vocabulary that may be foreign to someone who has never worked through a wayfinding project before. As a result, we often see communication issues arise because there’s no middleman or conduit to help you understand their recommendations. Elevated accountability – Your design team has been with you from the beginning of your new wayfinding story. The finished product is a reflection of their expertise, so they’ll take full accountability for design coordination, production and installation. If problems occur, they’ll solve them right away – likely without you ever knowing. Attention to detail – Like building a new house, wayfinding implementation requires so much detail. In addition to shop drawings and design instructions, there are color proofs, material samples, layouts, performance standards, compliance requirements (especially with roadway and traffic signage), warranties, press checks and more. Your designer will carefully review all of the documentation, proofs and final materials, and bring up any questions or concerns on your behalf. Cost savings. When we hire external fabrication contractors, we only use firms that we have established a good rapport with. We can put pressure on them to make material or fabrication recommendations that maintain or improve the quality of the finished product while also bringing a cost savings to you. No worries. Aside from this not-so-little wayfinding project, you have a variety of other responsibilities on your plate. If you’re working with an outside contractor, you have to manage all of the coordination and communication alone. On the flip side, if you work with your wayfinding designer, all of the legwork is off your plate. You focus on what you do best while they handle what they do best. Additional costs – Yes, there are some additional costs to hiring your wayfinding design team to handle implementation since it’s extra work and time for them. While we completely understand that you may not have the funding to maintain this relationship, you should at least be aware of the potential high costs of not doing so. The beginning – the design – won’t be worth your investment if it’s not fabricated and implemented to spec, making your vision the reality. Ultimately, you own, maintain and manage the finished wayfinding program. You need to make decisions that align with your overall goals, as well as your budget. And sometimes, the most affordable path is the one that maintains the integrity of the strategy and design in which you’ve invested.